DinoBoy will be entering P3 soon and the new school term means he will finally get to study the Science subject, something that he has great interest in since he started primary school. For the past 2 years, the school and the student care centre has arranged a few excursions to our Science Centre Singapore, after he comes back from that place he has so many things to tell me. He will share with me the activities he did, the exhibits he saw and the things he learn that day. To him, it has always been a great and fun trips to the Science Centre Singapore. Thus I decided to take a look at what Science Centre Singapore has to offer to our children all year round at their permanent exhibits and also their school holiday programs. I was surprise that they have so many activities that are interesting, informative and educational. No wonder DinoBoy is so happy every time he goes to the Science Centre Singapore with the school. The following activities we are recommending are for 9 to 12 years old and may not be suitable for younger kids. To check out their other activities, just head off to their events page over here. Limited to 30 participants per session. About the Activity : Paints are found everyday around us – they make objects attractive, prevent rusting and brighten up our lives. In this lesson, we are going to explore how people in the past made paints, as well chemical methods of preparing paint pigments. At the end of the lesson, use the paints you prepared to create your very own masterpiece to bring home! Discover your inner artist as you learn more about paint and how art and science is linked! Cost : $50/child (excluding admission charges & GST). About the Activity : Someone has been murdered at the barber shop and it’s your job to uncover the mystery! Do you dream of becoming a detective or a forensic scientist? If your answer is yes then come on down to the DNA lab to learn the different forensic science techniques in this fun-filled workshop. Solve the crime like a forensic scientist in this workshop by learning microscopy and fingerprint dusting techniques! Cost : $175/ child (excluding admission charges & GST). 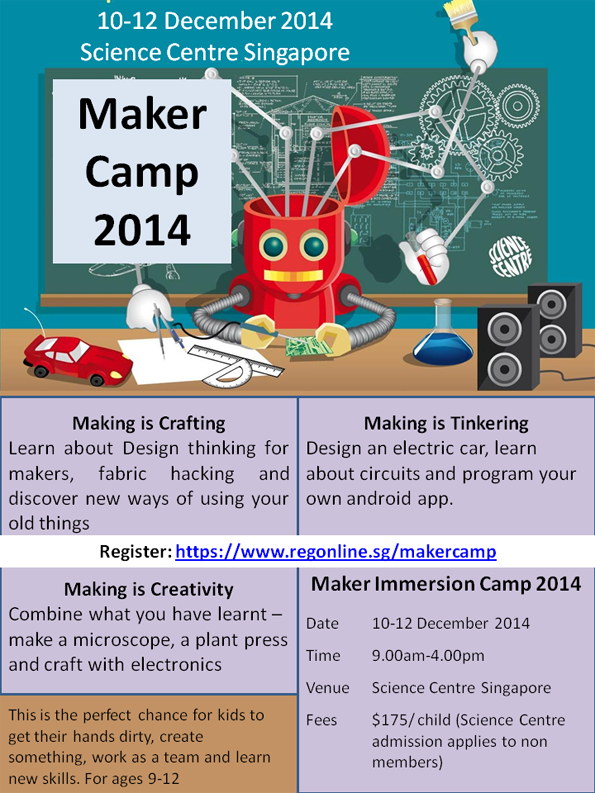 Maker Immersion Camp 2014 inspires ​kids ​to ​discover ​the ​Maker ​in ​them and is the perfect chance for them to get their hands dirty, break things, fix things, create something, work as a team and learn new skills while having loads of fun! Cost : $350/child (excluding admission charges & GST). Join the green or blue transformers team in this upcoming Transformer sleepover camp! Participants will learn how to build and programme their robots to solve tasks, and also create their own animation! Participants will also get an exclusive guided tour of the exhibition after closing time and also the chance to sleep under the protection of the 6m tall Optimus Prime and Bumblebee! Who shall win the AllSpark? The answer is more than meets the eye…. *Click here for more details! Cost : $40 1 parent + 1 child, $20 for any additional parent or child (excluding admission charges & GST). About the Activity : Hook up, get up and look up to the sky! Learn about the tips and tricks about rock climbing and more! Understand about the biomechanics of climbing, the main muscle groups used and how climbing equipment are used to ensure our safety during the climb. Then, team up with your family and pit your skills at “The Cliff”. Encourage each other and overcome the difficulties together as you scale our 15m tall rock wall! Dare to climb is a fun and thrilling programme that will not only put your new found knowledge and body to good use but definitely a engaging family bonding experience that you will never forget! For more details on registration and fee click here! Disclaimer : We are in no way affiliated to the management of Science Centre Singapore. 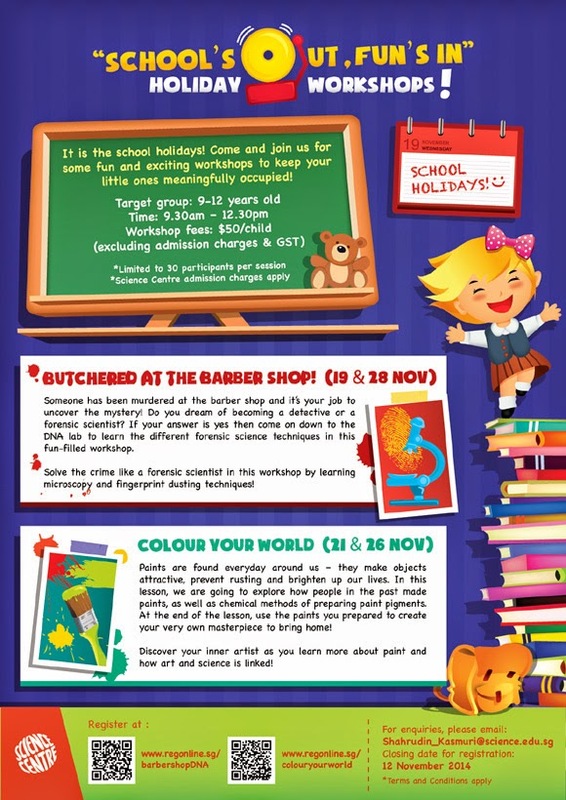 The sole purpose of this post is to share with everyone the holiday activities we think you will love to participate. All opinions are 100% on our own, no compensation were received for this post.